When publishing content, Cloudpress will keep a history of all the documents you have previously published. 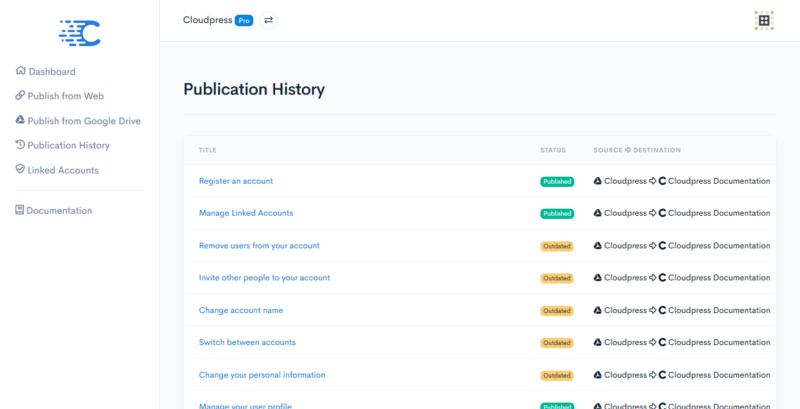 This publication history allows users to review the status of previously published documents, as well as allow users to re-publish content when the source content has changed. 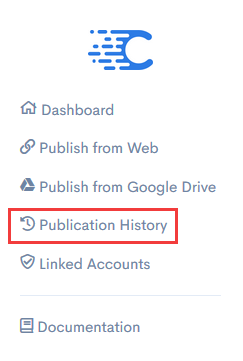 You can access the publication history by selecting the Publication History option from the navigation sidebar in the Cloudpress Dashboard. You will see all the documents you have previously published listed, with the most recently published documents listed first. The list of documents will contain the Title of the document, the status, as well as the source and destination account names. Outdated: Indicates that the document has been previously published, but has since changed on the source account. Queued: Indicates that the document has been queued for publication. The document will be published within the next couple of minutes. Publishing: Indicates that Cloudpress is in the process of publishing the document to the destination account. To view a published document’s detailed information, click on the title of the document.